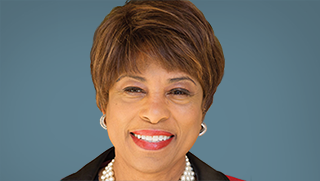 Congresswoman Brenda Lawrence represents Michigan’s 14th Congressional District, which includes Oakland and Wayne counties. She was elected to the U.S. House of Representatives in 2014. She is a Ranking Member of the House Oversight and Government Reform Committee’s Subcommittee on the Interior. She is also a member of the House Committee on Small Business and serves on the Subcommittee on National Security; Agriculture, Energy, and Trade; and Contracting and Workforce.